ATN Channel Seven Sydney. 1961. Producer: Kevin Ryder. LP (ST) Festival. LL-30739. 1962. The Way I Am. (Gary Geld - Peter Udell). Li’l Ol’ Me. (Jerry Smith). Beggin’ On My Knees. (Rod Stanton). We Should Be Together. (J. Loudermilk). I Like It Like That Part 1. (Chris Kenner). Lost Weekend. (Wayne P. Walker). Fings Ain’t What They Used To Be. A Star Fell From Heaven. (Ruth Feiner - Hans May). Get A Job. (The Sillhouettes). When The Bells Stop Ringing. Happy Times Are Here To Stay. (Carole King - Gerry Goffin - Cynthia Weill). 8LP(t) (OP) Festival. L80881/8. (Boxed set). (CA C 80881/6, CD D 80881/8). 1988. "J.OK SO TOUGH". 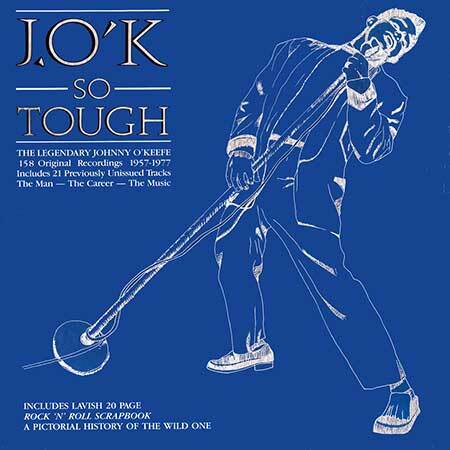 Record 8-S1-Tk1 Intro: The Johnny OKeefe Show Theme. (0:22).